Who doesn't love a good shopping incentive? I know I do. That's why I wanted to "shop" the Shopbop sale with you. The online retailer is offering discounts on select merchandise site-wide PLUS they're offering buy-more-save-more incentives. Full details below. 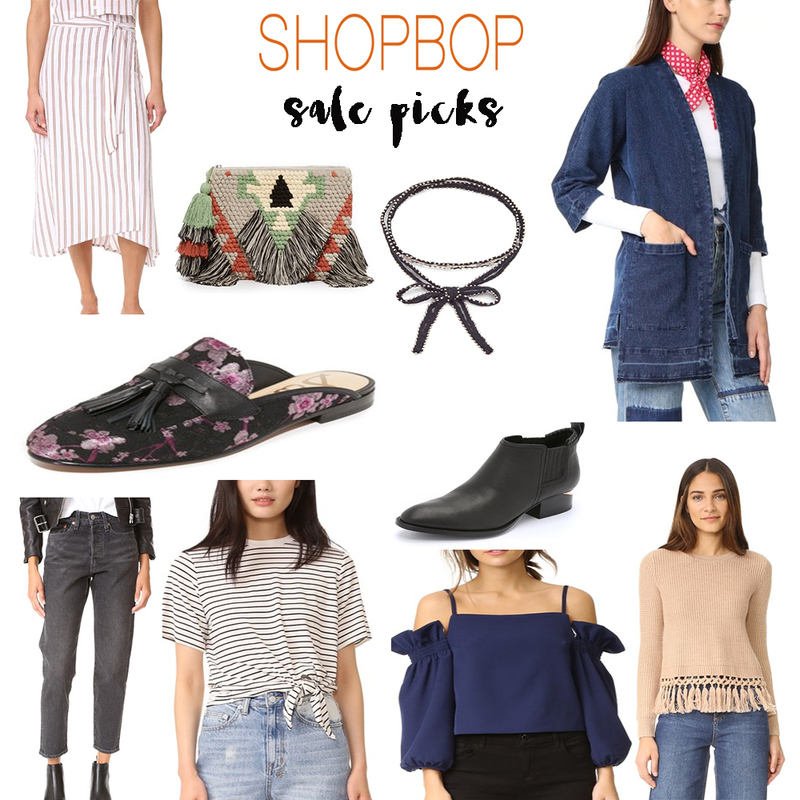 So, with deals and steals in mind, I’ve rounded up 10 of my favourite items from the sale — each of which checks one of the top trends of the spring 2017 season. Think of it as your ultimate shopping guide to spring trends. And the best part? It’s all on sale! Denim is EVERYWHERE lately, and that's going to continue into fall. That's why, my first pick of the sale is my current fave denim fit: the Levi’s Wedgie jeans. You can bet your (blue-jean) bottom dollar that I have these black iterations on my hit list for spring. Just think, we could be twins. Gucci officially brought back the mule loafer in a HUGE way. But not all of us are keen to spend almost a thundy (otherwise known as a thousand!) on a pair of shoes. From the brocade exterior, to the Gucci-esque style, these Sam Edelman Paris Jacquard Mules hit all the top style marks. At a much lower price point, of course. As mentioned above, denim is one of the hottest textiles of the season forever. In addition to wearing the timetested textile on your lower body, consider a cool denim jacket like this 3x1 WJ Cocoon Wrap Jacket. It hits several major trends at once including a robe-like kimono cut, longer length, raw hemlines — and more. Let's face it, a great T-shirt is always in style. But this season, I'm lusting after something with a little more detail than a classic style. This The Fifth Label Destination T-Shirt striped tee gets a dose of added interest from a front knot and a slightly cropped style. Order and wear on repeat. This trend is definitely NSFW (not safe for work, obvs), but it's perfect for the weekend — or, an amazing spring getaway. The Style Mafia Maeve Top boasts a chic blue hue and added ruffle detailing, in addition to it's oh-so on trend off-the-shoulder silhouette. #whatsnottolove? Ankle boots have the potential to be the biggest workhorses in your wardrobe. Not to mention, they're super chic and versatile. These Alexander Wang Kori Ankle Booties are a cult-classic style for a reason. They boast a flattering shape, a perfectly soft almond toe and the trademark Wang heel detailing. I would legit collect them in all the colours if I could, but maybe we should just start with black first. Fringe? Check. Cool colours? Check. A boho-chic vibe? Check, check. This Cleobella Domino Clutch covers so many trends, it's practically the spring 2017 sartorial season all wrapped into one. I dream of pairing it with a simple pair of blue jeans, a white tee and a killer pair of sunnies. En route to a fab beach vacay, of course. Again, as I mentioned above (boy, I really tend to get ahead of myself!) fringe is in for spring. I love the idea of wearing it in a completely unexpected way, so, this Club Monaco Beberly Sweater provides pretty much the perfect way to do that. The luxe lightweight knit fabric means this sweater will play nice during the transitional days of early spring, as well as being a good layering option come fall. What would a spring style roundup be without a great skirt? Not a very good one, I'd say. But even if I didn't feel compelled to include a skirt in my list, I would have picked this FAITHFULL THE BRAND Caribe Wrap Skirt anyway. From the laidback wrap style, to the chic stripes, it has me dreaming of the warmer days of spring. Happy Friday — and even happier shopping!